For its Dutch plant in Maastricht, the global steel giant contacted Carer, as it was the only company capable of designing and making a forklift truck with a capacity of 16 t to handle coils. 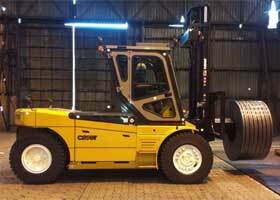 It had to have the same performance of the diesel forklift truck used previously. Thanks to the constant exchange of information with the customer, Carer’s SPED department designed and built an extremely high-performance version of the standard R160 model which, thanks to the use of enhanced motors, can travel up to 20 km/h under full-load conditions with excellent performance levels in hoisting mode and with the operating time required to complete a demanding work shift. Travel up to 20 km/h under full-load conditions with excellent performance levels in hoisting mode and with the operating time required to complete a demanding work shift.